"The best laid plans of mice and men often go awry." I think that sums up life here recently. We never thought the home improvement project(s) would last 5 weeks. We never thought we'd be spending as much as we are. We meant for it to start in April, but it started in March. Mom meant to come at the end of March, instead she came in mid March. We never meant to end up with new baseboards or new chair rail. We never meant to paint the sunroom trim. There are a lot of 'we never meants' recently! So my mom heads home to Las Vegas this week. SP & I wanted to take her out for a nice dinner to say thank you for spending nearly 5 weeks here helping us with the home improvement project. She has wiped up the floors countless times, dusted furniture countless times, done errands, painted, washed clothes, moved furniture, washed and hung curtains... and so much more. The plan was to have dinner at Kiku at Station Square. But we got sick. We never meant to get sick. Of course, no one means to get sick. First SP started saying he felt like he was coming down with a cold, and by Friday evening he felt awful. It started to really affect me Saturday evening (after dinner) and by Sunday I was carrying a box of tissues around the house. Saturday was rainy, windy, cold, damp and we were both feeling sick, so we had to cancel our dinner out with mom. Instead, we ordered take out from Bravo and she went to get it. 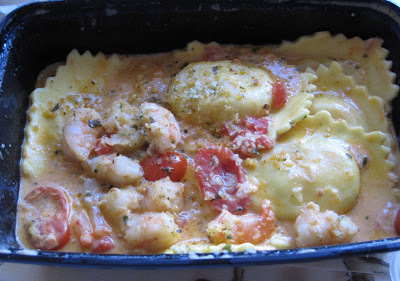 I guess being sick makes me hungry because I ate a lot of food - and drank a few glasses of wine! I wasn't yet taking medicine so mom and I shared a bottle of Greg Norman Shiraz - very good. There was a bag filled with 9 pieces of Bravo's herb bread and there were 2 containers of dipping oil: Yum! I really like the herb bread. I ate 4 pieces. Then I ate some Insalata Della Casa (chopped greens, cucumber, tomato, bacon, crispy pasta, and creamy parmesan dressing): Mom and I shared it, so here's mine on a plate. I love how small all the components are. 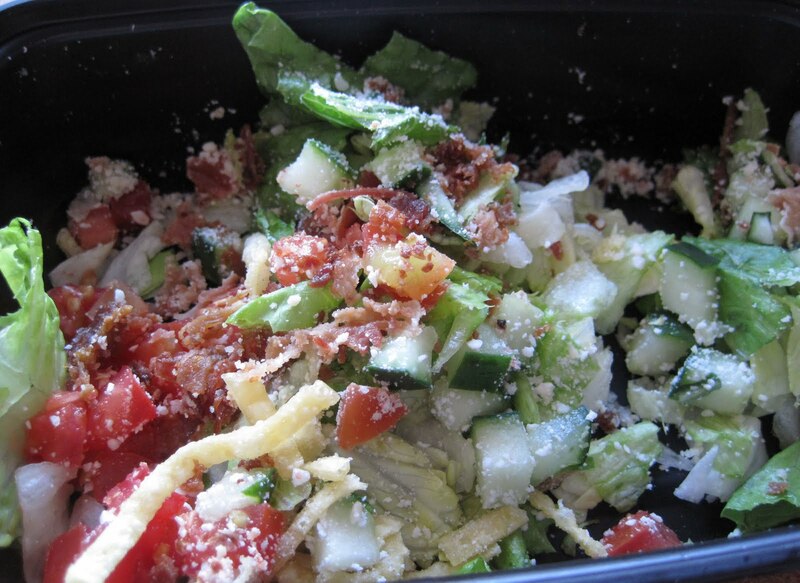 Plus the bacon and creamy parmesan dressing! 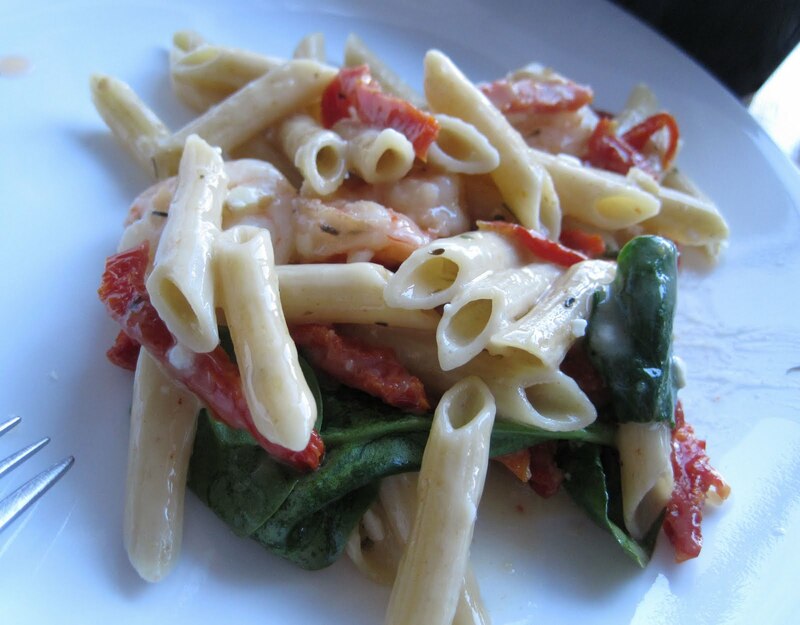 SP ordered Penne Mediterranean (spinach, sun dried tomatoes, pine nuts, olive oil, and feta cheese, tossed with multi grain pasta) : He says it was a little more garlicky than he expected, but that he shouldn't be too surprised since since it is a Mediterranean pasta. He had a choice of 5 or 10 shrimp when he placed the order, and he chose 5, but then ended up wishing he'd chosen 10. He ate half and saved half for lunch on Sunday. 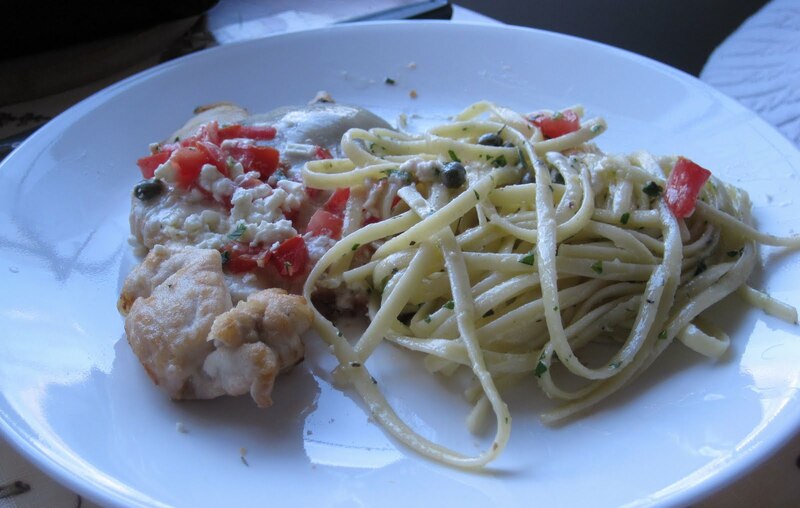 My mom chose Chicken Scallopini (sauteed chicken with roasted portobello mushrooms and provolone with lemon caper butter sauce, feta, and diced tomatoes, served with herb linguine): She enjoyed her meal and saved half of it for lunch on Sunday. 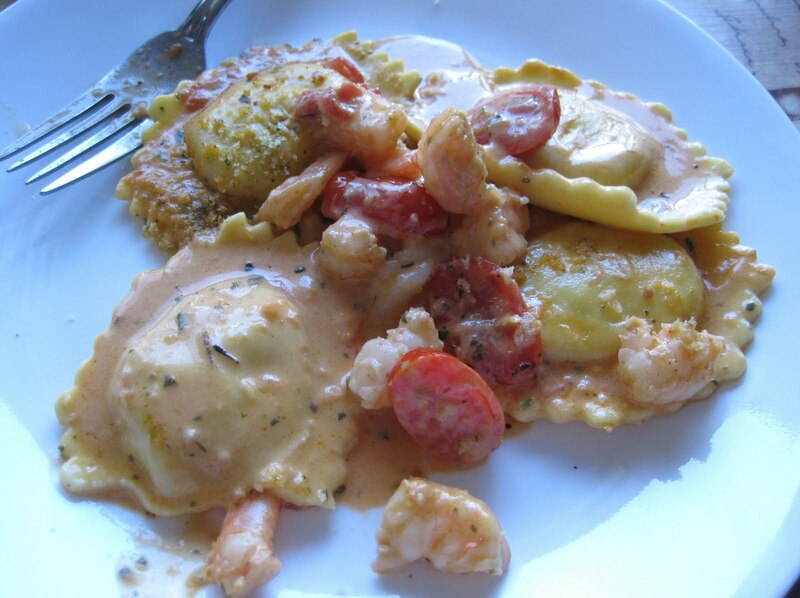 I chose Lobster Ravioli Alla Vodka (with sauteed shrimp, grape tomatoes in a tomato cream sauce topped with pesto bread crumbs): The sauce was really yummy, the shrimp and tomatoes really tasty, and the ravioli good, just they didn't have a big lobster taste to me, which was kind of disappointing. I saved 3 ravioli for lunch on Sunday. 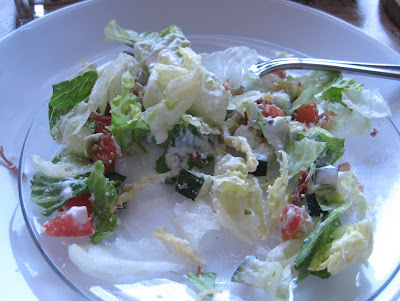 I think there were 7 or 8 in the serving, and 4-5 were plenty for me for dinner with the bread and salad. 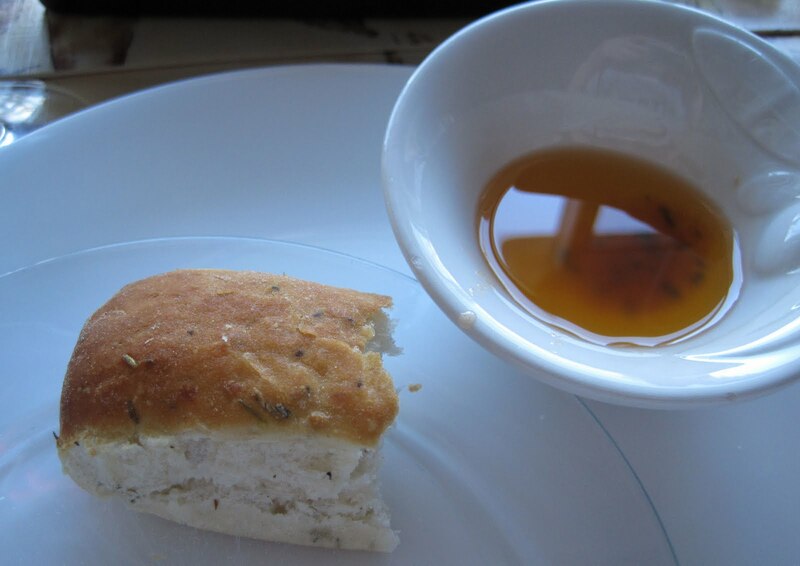 I useds some of the herb bread to scoop up all the yummy sauce. I also got tiramisu for dessert, but I didn't take any photos of it since I ate it a couple hours after dinner. It was tasty, as always, I really like the sauce with the tiramisu. All in all a good dinner, I just felt bad that we were too sick and the weather too nasty to take mom out, plus I'd really been looking forward to my first trip to Kiku in 3-4 years.